I think I may have titled more than one blog post like this, with different dates. The last time we crossed Texas was in 2014, and we took our own sweet time, visiting the Davis Mountains, Big Bend National Park, Seminole Canyon, Corpus Christi, Port Aransas, and the wonderful Anahuac National Wildlife Refuge. This time it is really just about Crossing Texas. A friend responded on Facebook with a little rhyming ditty, “The sun is riz. The sun is set. And we ain’t out of Texas yet.” Bout sums it up. Actually it isn’t all that bad. We aren’t sight seeing, but neither are we busting chops to get across as quickly as possible. We left Mike and Janna’s place in Southeast Arizona at a comfortable 9AM, and traveled a short day on I-10 to Fort Bliss in El Paso. 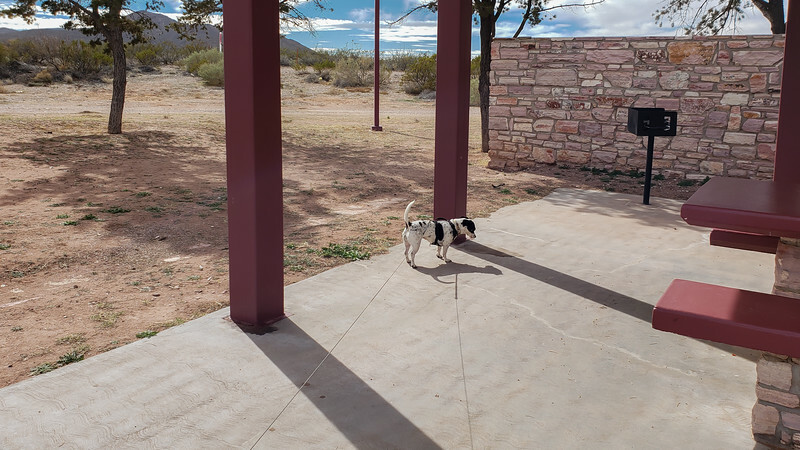 We passed the big road runner approaching Las Cruces, reminisced about our stays at the Hacienda RV Park and visiting Old Mesilla, and just kept driving. 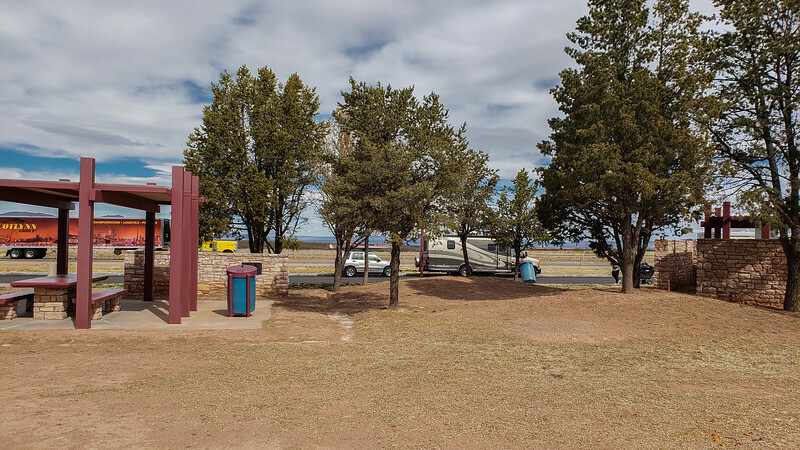 We took the back way into the campground, described very well on the Military Family Camp website, happy to skip the heaviest traffic approaching and through El Paso. It had been a short day and we arrived shortly before 2PM. Just barely in time to take the second to the last spot available for the night at the park. No reservations at this military camp, like many others we have visited, but this one doesn’t have any kind of overflow accommodations. We knew this going in and had plans to just keep driving if need be. The camp is rated very highly, with many folks saying it is among the best in the country. I would beg to differ with that. Maybe not a lot of folks have made it to Sigsbee in Key West, or had the pleasure of visiting what we think is the very best family camp ever on Whidbey Island in Washington State. Still, it was a decent stay, on a par with perhaps Flag City RV. Well run, full to the brim, plenty of space between sites, concrete pads and patios that are reasonably level, and full hookups. Local TV stations came in just fine with the new antenna. Dinner was fabulous, quite easy, with a small batch of fresh homemade tartar sauce, and salad out of a package as my only effort to go with the leftover fish we had from our evening out with Wes and Gayle. High winds were predicted with warnings for 50mph gusts the next day in the El Paso area, but when we listened on the news and reviewed the forecasts, we were happy to see those winds wouldn’t be around until mid day when we would be long gone. In spite of the proximity of the freeway, I put in earplugs and slept just fine. Waking this morning to clear skies we were on the road by 9. With another fairly short day ahead of only 245 miles we could take our time. We fueled at the station right at the park, grumbling to ourselves about the less than 87 octane fuel that seems to be all over some of these western states. The advertised price is for 85 or 86 octane. Who even uses that?! Of course, the higher octane 88 stuff is 30 cents per gallon more. I guess we shouldn’t complain, we are paying at least a dollar less per gallon than we paid for fuel on our last cross country trip in 2014. Mo and I took turns driving, jockeying with the big trucks on the highway that was sometimes smooth and sometimes ridiculously rough, especially in areas of grooved pavement. I had to look that one up to try to figure out why in the world they did that and discovered it was to add traction and prevent hydroplaning in areas that have accidents due to wet roads. Well, those dang ridges will drag a motorhome all over the place, talk about an accident waiting to happen. Sheesh! We stopped at a decent rest area for a lunch break and a walk for Mattie. Lunch was simple, and the same as we usually have at home. Cheese, some dip, veggies and a few crackers, and a few grapes. Mo loves cauliflower and it is Mattie’s favorite as well. That little dog loves her veggies! We try not to give her people food, but relent with cauliflower and carrots. 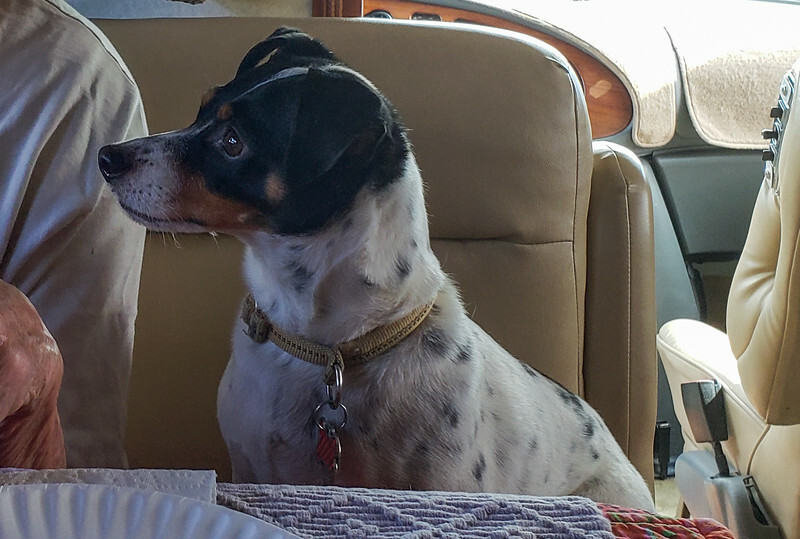 She is very good about not begging, or being rude, but she does pay rapt attention when we bring out the veggies and dip. 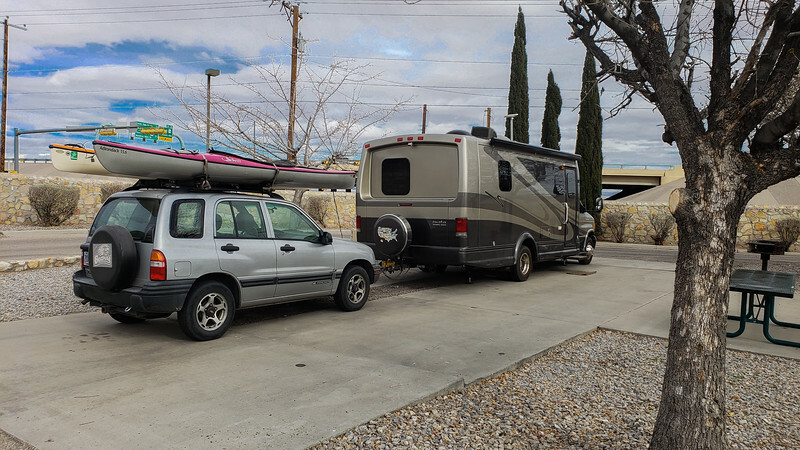 We traveled along the route for a couple more hours, reminiscing again about our stay at Balmorhea State Park as we passed, about our time in the Davis Mountains, remembering how wonderful it was to be at Big Bend. We even remembered stopping in at the museum in Fort Stockton on one of our trips, who knows which one. 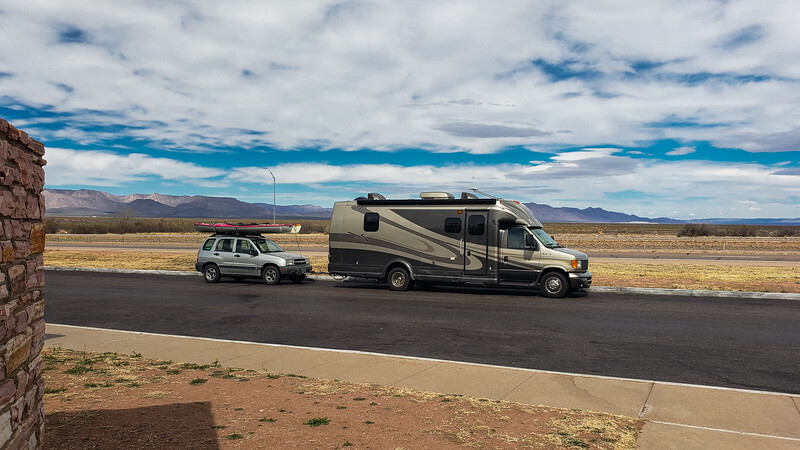 This time we stopped only for fuel at the Flying J and pulled into the Fort Stockton RV Park by 4 in the afternoon, even with another hour lost to the time change. It is a fairly big park, and at $36 per night with both AAA and Military Discount, reasonable enough for this part of the world. 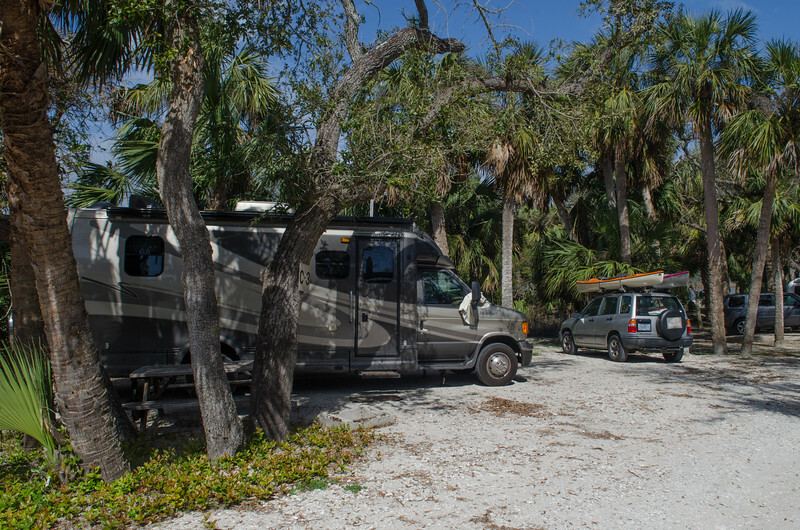 There are full hookups, gravel and dirt pads that are long and level with grass between reasonably roomy sites and picnic tables. I was glad we had made reservations, as the park filled to the brim as the evening progressed. 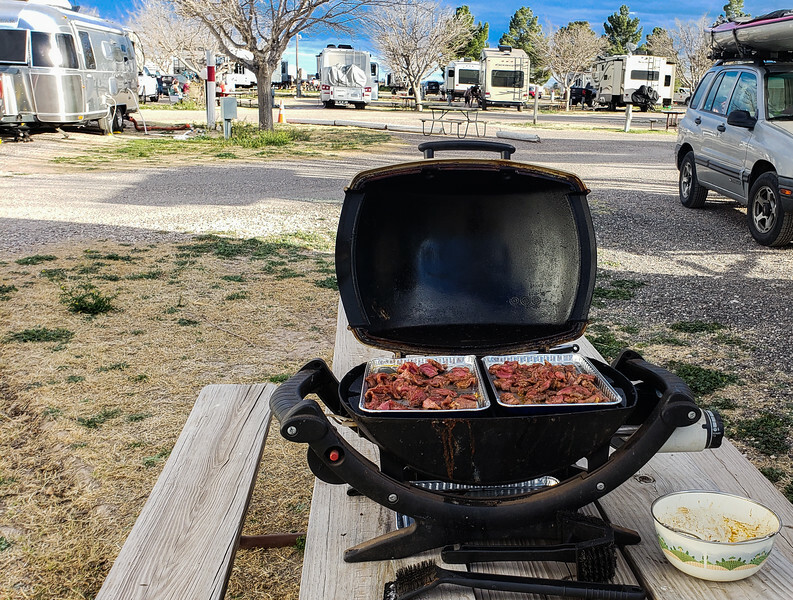 It was Super Bowl night, and I guess it is a big thing to load up a bunch of friends and go hang out in the RV park to watch the game. We saw many groups gathered around their outside TV’s and the smell of all sorts of game food appetizers wafted our way as we settled in. 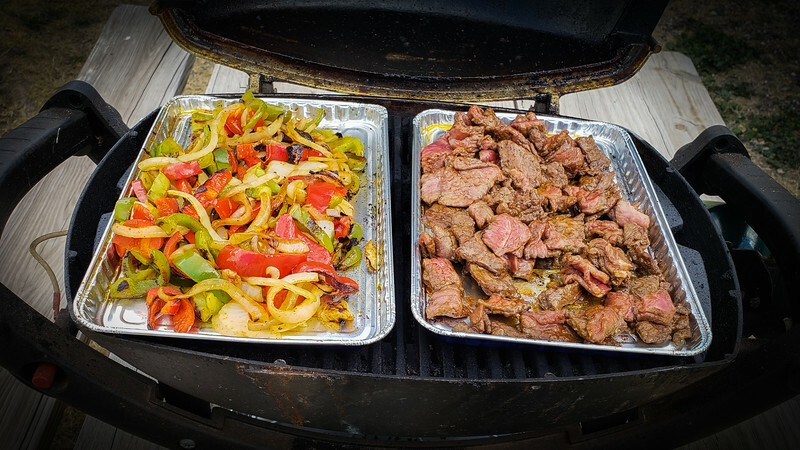 I had my own food planned, with fresh peppers and onions and strip steak cooked on the grill for some very tasty fajitas. We even watched the game a bit, simply because we had cable, but weren’t interested enough to go past the rather stupid half time show, and I didn’t see a single commercial that was memorable. Mo used to big a big football fan, but has lost interest in the last few years. I caught up with family and friends, sharing photos and conversations as we “chatted” back and forth on messenger. The Brothers decided to travel north from Desert Hot Springs via Highway 395 with hopes of boondocking in the Alabama Hills. Word today was that it was too cold and wet and windy for that and instead they camped at a park in Lone Pine, and continued on toward Minden today. Looks like the weather isn’t very much in their favor with snow predicted for Minden. Later we fell asleep listening to the hoots and hollers of the game watchers gathered around us in the dark. It is even later now, and I couldn’t stay asleep, and got up to read and write a bit. Now the park is dark and quiet, without the rabble rousing sort of stuff I might expect from a bunch of fans partying. The only sound is the soft roar of I-10 to the south of us, and I have ear plugs to deal with that when I make an attempt to go back to bed. Tomorrow we will have another reasonable day, traveling 315 miles to Fort Sam Houston RV Park at Joint Base San Antonio. We will be staying 2 nights for a little bit of a break from the one night stands we have had since leaving Organ Pipe. Texas is Huge! And never really been my cup of tea. Haven't been to Big Bend, yet. You can have the rest. Returning from Virginia last fall, I thought we'd never get through Texas. It is one really big state. Travelling Texas doe take a while we have driven it more times than I remember, various different routes. Enjoy your time there and relax a bit. Continued safe travels. I have followed you across Texas on your blog, George, quite a few times. Did you not see the Amazon commercial with the little dog ordering his pallet of dog food using Alexa? ?--my favorite but the game was awful! My family came to WY from AR one year to go snowmobiling in Yellowstone Park--I was living in WY at the time pre-Cowboy. With my family was an exchange student from Holland who described driving across Texas--"when you drive this far in Europe you are in another country, we aren't even out of the state of Texas yet!!" Sorry to say I missed it somehow, Janna, not sure if I got sidetracked or quite too early. Love that statement about Europe. One of the reasons I couldn't move to Italy, no matter how lovely. Not enough open space. Glad you liked the ditty. Takes a drive across it to realize just how big Texas is. Thanks for sending it Mary Ann. Yes. BIG. and often so very boring. We wandered enough on our previous trips, now just want to cross it. Sounds like we've stayed in some of the same parks. I guess we know how to find the decent ones! Sure hope we don’t have to route ourselves through Texas when we make the trip back from Virginia in March to escape weather. Done the crossing Texas thing enough times.